Cheetah diet includes small to medium antelopes such as Thompson’s gazelles and Impalas, young of larger antelopes, young warthogs, rabbits and game bird. Their preys will usually be under fifty kilograms. Cheetahs eat about 6 lbs (2.7kgs) of meat per day. Cheetahs need to drink once every 3 to 4 days only. 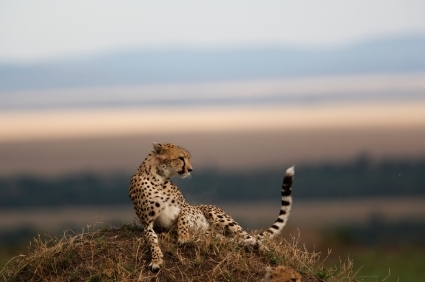 The cheetah hunts during the daylight as they hunt by vision rather by scent. He gets as close to the prey as possible, usually not further than 20 meters, because they unable to run fast on a long distance. When the prey is close enough, he will go for it by knocking it to the ground with its paw and bite it at the neck.